A lavish, rich and filling starter, the bone marrow is served with a spoon and toast on the side. Sprinkled with parsley salt and parmesan for added flavour. Made up of a whole rabbit and pork, the terrine is simple and fresh. The red mini tomatoes create a dry, juicy flavour that pair perfectly with the soft, moistness of the terrine. Served with crispy bread on the side and a scattering of beautiful edible flowers. This ultimate burst of health with wonderful pairings of textures and flavours. The crunch of the Kale is brought out by the pop of the pomegranate seeds. Roasted Butternut Squash . Mixed Grains . Sultanas . Harissa . An exquisite rendez-vous of herbs and spices – it is a salad for everyone, both spicy, light and creamy with a deliciously zesty aftertaste. The pan fried sea bream is warm and refreshing with a crispy outer layer, framed in a bed of roasted artichoke. A healthy and wholesome heaven! A spectacular platter of vegetables of all textures and tastes. 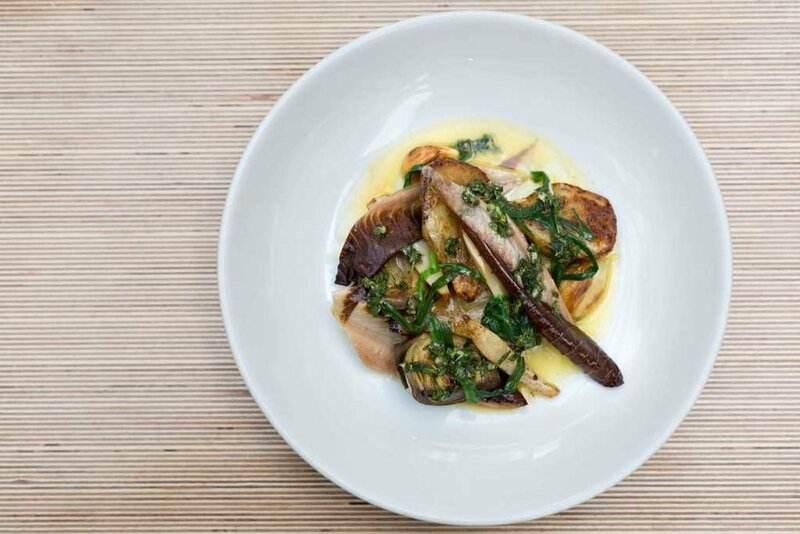 The artichokes are boiled in water and lemon juice and then pan fried in salt, creating a most exquisite flavour. The cooked Pedro garlic brings the intensity of the flavour out of the dish and the salsify (also known as devils fingers) evokes an earthy sensation which pairs perfectly with the bitterness of the Treviso leaf. The warm softness of the vegetables and the light crunch of the artichoke is pure heaven! Suitable for vegans.